Rapid software development and its massive deployment into practice brings a lot of problems and challenges. How to evaluate and manage the existing software in an enterprise is not an easy task. Despite different methodologies in IT management, we encounter problems with how to measure usability of software. Software usability is based on user experience and it is strongly subjective. Every IT user is unique, so the measurement of IT usability has often qualitative character. The main tool for such measurement is survey, which maps her or his needs of daily work. The article comes from experimental study in the medium-sized company. It was based on the idea of using rule-based expert system for measurement of software usability in enterprises. Experimental study gave a more detailed view into the problem; how to design the fuzzy-rules and how to compute them. 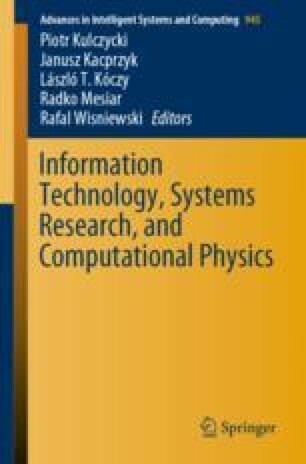 The article points to problems in designing a computational model of software usability measurement. Thus, it suggests a computational model, which is able to avoid the main problems arising from experimental study and to deal with the uncertainty and vagueness of IT user experience, different number of questions for each users group, different ranges of categorical answers among groups, and variations in the number of answered questionnaires. This model is based on the three hierarchical levels of aggregation with the support of fuzzy logic. This paper is part of a project VEGA No. 1/0373/18 entitled “Big data analytics as a tool for increasing the competitiveness of enterprises and supporting informed decisions” by the Ministry of Education, Science, Research and Sport of the Slovak Republic.